Ciceronis Travel has been added to your itinerary. To see where to stay, photos, reviews, and more tourist information, use the Wayanad trip planner . Chennai to Wayanad is an approximately 6.5-hour flight. You can also drive. When traveling from Chennai in May, plan for slightly colder days and about the same nights in Wayanad: temperatures range from 38°C by day to 30°C at night. On the 8th (Wed), you'll travel to Kodagu (Coorg). Kick off your visit on the 9th (Thu): take in nature's colorful creations at Raja's Seat and then look for all kinds of wild species at Dubare Elephant Camp. Get ready for a full day of sightseeing on the next day: take in the dramatic scenery at Abbi Falls, don't miss a visit to Raja's Tomb ( Gadhige), and then take a peaceful walk through Nisargadhama Forest. Inspirock's itinerary builder makes planning a Kodagu (Coorg) trip simple and quick. You can drive from Wayanad to Kodagu (Coorg) in 4 hours. Wrap up your sightseeing on the 10th (Fri) early enough to drive to Mysore District. Mysore District is an administrative district located in the southern part of the state of Karnataka, India. 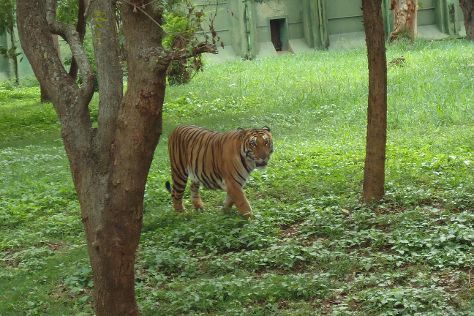 Kick off your visit on the 11th (Sat): get to know the resident critters at Sri Chamarajendra Zoological Gardens, take in the spiritual surroundings of Jama Masjid, and then admire the local landmark of Brindavan Garden. Get ready for a full day of sightseeing on the next day: examine the collection at Railway Museum Mysore, then step into the grandiose world of Mysore Palace (Amba Vilas), then grab your bike and head to Outback Adventures, and finally get up close and personal with brilliant marine life at Planet Earth Aquarium. You can drive from Kodagu (Coorg) to Mysore District in 2 hours. Another option is to do a combination of bus and taxi. May in Mysore District sees daily highs of 34°C and lows of 25°C at night. Cap off your sightseeing on the 12th (Sun) early enough to travel back home.